Bram Deagan dreams of bringing his family from Ireland to join him in Australia, where he now runs a successful trading business. But when a typhus epidemic strikes Ireland, it leaves the Deagan family decimated. And, with other family members scattered round the world, it is left to Maura Deagan to look after her orphaned nieces and nephew. Forced to abandon her own ambitions, and unsure whether she is ready to become a mother to three young children, Maura makes a drastic decision: to join Bram in far-away Australia. They set sail on the SS Delta, anxious for their futures. It is only when a storm throws Maura and fellow passenger Hugh Beaufort together that she realises this journey may also give her a chance to pursue a dream she set aside long ago: to have a family of her own. That is, until someone from Hugh's past threatens to jeopardise everything . . . THE TRADER'S DREAM is the third novel in Anna Jacobs' wonderfully atmospheric new saga series 'The Traders', set in Europe, the Orient and Australia's Swan River Colony. Have thoroughly enjoyed the whole series. The combination of history and the lives of the characters is addictive. Easy to read but very hard to put down. The whole series of the traders was excellent reading. I would recommend this book to any reader. 5.0 out of 5 starsEnjoyed this! 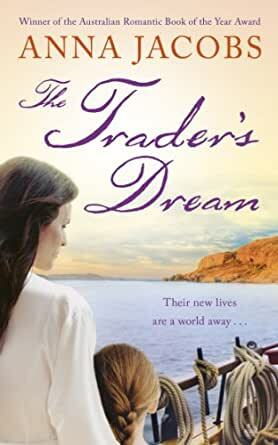 The Trader's Dream is book three of the latest historical undertaking by Anna Jacobs, The Trader Series. These books have a rich mix of characters travelling to and from Fremantle, Western Australia. Each story supports the growing business endeavours of Bram Deagan a minor character in the preceding three book historical series by Anna Jacobs, The Swan River Series. Bram was an impoverished Irish Immigrant with a passion to make good. In book one of The Trader Series, The Trader's Wife, Bram finds a wife and supporting business partner, Isabella, in Singapore before establishing an emporium in Fremantle. In book two, The Trader's Sister, Bram's sister Ismay, desperately journeys from Ireland hoping Bram can help her survive. The primary focus of The Trader's Dream is upon the journey undertaken by Maura, Bram's Aunty who leaves behind a promising future in England to accompany three orphaned and destitute children to Western Australia in the hope that Bram will adopt them and secure their future thus allowing Maura to recover something of her own. Though in an Anna Jacobs novel nothing ever seems to follow the chosen or obvious path. The Trader's Dream has a wonderful diverse mix of new and pre-loved characters cleverly introduced to draw the reader into the most delightful web of intrigue, injustice and satisfaction ever likely to be encountered within the cover of a single novel. There is a minor character in this book, named Eleanor, who is quite possibly the most engaging, beautiful, romantic and elegant person I've ever read about. I live in hope that the author will see fit to revisit Eleanor in a future novel. Anna Jacobs take on creating fiction never fails to impress. For The Trader's Dream, five stars. I believe the next novel of the series is titled The Trader's Gift. I'll be purchasing my copy the day it appears on bookshelves. Each book in this series has supported to lower class of people and showed how well they can do in life love the main characters and how they flow in their own ways throughout the series. Dreams are so important and challenge us to be our best if we stick with it. Book Three of 'The Trader Series' you do need to read all the books as they keep you wanting more. A delightful series, which I loved to the end...very satisfying. Well written and great historic detail. Like all Anna Jacobs novels I love them, easy to read, fun and a tad bit of sparkle. I won't give my version of events as I find that boring, each person likes a book for different reasons, but I always enjoy the historical moments with the companions of each relationship and how they grow together. Of course I eagerly await another novel. A pity that the Lanchashire series is finished, I wanted it to go on and on. I have loved every book of Anna Jacobs about (The Traders)... If you haven't read any of the first books in this series, no matter, all will be reveled, giving you a quick lead up to this series.